Quetzalcoatl(Kukulkan) the Man the prophet , a Revered King Shaman which taught love and abolished human sacrifice. Some people of the Mormon religion believe the man Quetzalcoatl was actually Jesus returning this time to the American natives. The historical Quetzalcoatl – was probably born around AD 947. His father, Mixcoatl, was ruler of the Toltecs. He was originally named Ce Acatl Topitzin, meaning “Our Prince Born on Ce Acatl,” the latter being an important Toltec holiday. His birth was immediately preceded by a horrendous family tragedy, the father having been deposed and murdered by a jealous brother named Ihuitmal. The unborn child’s pregnant mother, Chimalma, fled to Tepoztlan. Before dying in childbirth, Chimalma declared that her infant son was divinely conceived because she had swallowed a piece of blue-green jade. Reared by his grandparents, Ce Acatl Topitzin was sent to the religious school at Xochicalco. There he so impressed teachers with his wisdom and piety that they conferred on him the name of Quetzalcoatl. Meaning “plumed serpent,” this was a prestigious title given to persons whose behavior shows signs of an exalted state such as that attained by a saint or a sage. Returning to Tula, Quetzalcoatl defied his usurping uncle by burying the remains of his father with the ceremony to which he was entitled. He then took over as new leader of the Toltecs by pushing the unpopular Ihuitmal into a sacrificial fire. Quetzalcoatl proved to be a wise and progressive ruler. In an action that demonstrated both sensitivity and enlightened self-interest, he imported a group of talented deaf-mutes known as nonoalcos to work as artisans in his kingdom. The nonoalcos were descendants of the highly skilled artisans of Teotihuacan and it was they who produced the distinctive designs for which Tula is noted — serpent columns, square pillars ornamented with friezes and giant-sized statues of warriors. Quetzalcoatl also abolished human sacrifice and decreed that henceforth sacrificial objects be limited to snakes, flowers and small birds. It’s at this point that the line becomes blurred between the historical and the legendary Quetzalcoatl. Though the priests were undoubtedly annoyed by his outlawing of human sacrifice, accounts of the actions attributed to them are obviously the work of myth makers rather than of responsible historians. 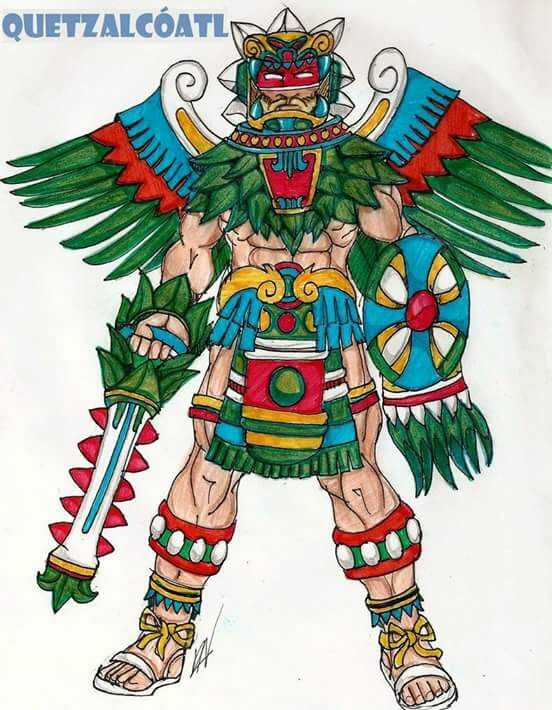 Deciding on a ruse, Texcatlipoca crept into Quetzalcoatl’s sanctuary with two minor gods, also evil, and frightened him by demonstrating a new invention: the mirror. Feigning friendliness, they disguised him by covering his body with red paint, feathers and a mask. They served him a delicious meal and Texcatlipoca persuaded Quetzalcoatl to drink a beverage of pulque mixed with honey. The concoction made him drunk and the conspirators then slipped a beautiful dancing girl into his room. He awoke the next morning with a hangover and the horrible realization that he had broken his priestly vow of chastity. Tormented with remorse, Quetzalcoatl wandered in self-imposed exile for twenty years and then ended up near what is today the Gulf port of Coatzocoalcos. There he said goodbye to a loyal band of weeping disciples, promising to return at some future time. He sailed for Yucatan, where he became equally admired by the Maya, who called him Kukulkan. Finally, some thirty years later, he died by immolating himself on a self-made funeral pyre. He promised that he will return and bring back glory to his people.